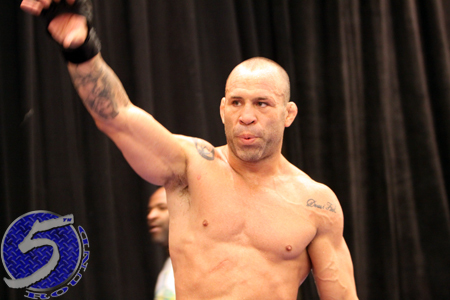 “UFC 147: Silva vs. Franklin II” takes place June 23rd inside Mineirinho Arena in Belo Horizonte, Minas Gerais, Brazil and features a rematch between Wanderlei Silva (Pictured) and Rich Franklin. To help hype the 190-pound catchweight bout, FUEL TV will premiere “Countdown to UFC 147” on Tuesday, June 19th at 9PM ET (6PM PT satellite). The documentary focuses on Silva and Franklin as they prepare for battle. Heavyweights Fabricio Werdum and Mike Russow, who serve as the card’s co-featured attraction, will also appear in the hour-long show. Silva was originally slated to headline the event against Vitor Belfort, but “The Phenom” was forced to withdraw with a broken left hand. Franklin hung a close unanimous decision win over “The Axe Murderer” at UFC 99 in June 2009. Replays of “Countdown to UFC 147” airs on FUEL TV on June 20th (5 and 7PM ET), June 21st (8PM ET), June 22nd (2 and 11AM ET) and June 23rd (7PM ET). The pay-per-view broadcast begins live in North America at 10PM ET/7PM PT.